"Companies want a management system that seamlessly addresses the requirements of multiple management system standards while serving as the foundation for continual improvement and organizational excellence"
Unfortunately, many organizations tackle QMS, EMS, and OHS standards individually and do not take advantage of the synergy that was designed into these standards. Furthermore, most companies focus on compliance or certification as the primary objective, instead of value. Continual quality and process improvement tools (e.g. Lean and Six Sigma) are almost never included. The resulting management system is often bureaucratic and does not support the efficient operation and improvement of the organization. A modern integrated management system treats QMS, EMS, and OHS standards as a platform for a business operating system (BOS) that also incorporates advanced quality tools and process improvement methods. Today's integration objectives are generally clear: companies want a management system that seamlessly addresses the requirements of multiple management system standards while serving as the foundation for continual improvement and organizational excellence. This is the founding principle of Pinnacle Enterprise Group (Pinnacle) and the primary objective of the Lean BOS®. Pinnacle supports the traditional integrated management system implementation by seamlessly integrating the Lean QMS®, Lean EMS®, Lean OHS®, and Lean EHS. Each is specifically designed to support integration and shares a common philosophy and methodology. This allows Pinnacle to scale and customize your management system integration. But Pinnacle's Lean BOS® is the ultimate expression of an integrated management system. It practically integrates Lean and Six Sigma process improvement methods with the QMS, EMS, and OHS. 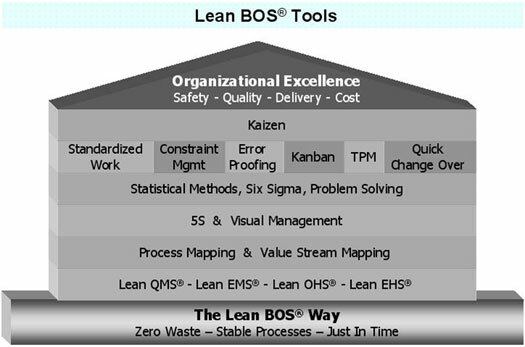 The Lean BOS® is a business system platform that supports continual improvement and organizational excellence. Lean and Six Sigma are process improvement methods. They do not provide guidance for integration with an organization's QMS or BOS. However, ISO 9001 based QMS standards (e.g. ISO 9001, TS 16494, TL 9000, AS9100, ISO 13485, etc.) are the established benchmarks for a QMS or BOS platform and structural framework. Ironically, Lean, Six Sigma, and ISO 9001 based standards have historically been considered rival initiatives. Lean and Six Sigma advocates note that ISO 9001 does not stipulate anything related to process speed, flow, and variation. ISO 9001 supporters point out that Lean and Six Sigma fail to address the fundamental need for a standardized business system platform and process management. Both sides are right. Yet these arguments are more often used to advocate choosing one over the other, rather than to support the logical conclusion of integrating Lean and Six Sigma with an ISO 9001 based QMS to produce a Lean BOS ® that serves as the true foundation for organizational excellence. 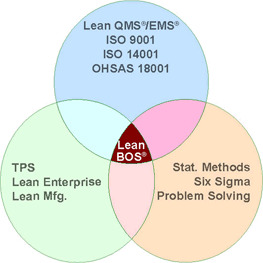 The Lean BOS® is Pinnacle's unique approach to the development of an excellence focused BOS that integrates the tools and methods of Lean and Six Sigma with an ISO 9001 based management system platform. In reality most Lean and Six Sigma projects fail to sustain their gains over time because they are not founded on an ISO 9001 based management system infrastructure that can capture and sustain the improvements. The ISO 9001 based QMS or BOS is typically regarded as a bureaucratic documentation system needed for external audits. Conversely, most ISO 9001 based management systems do not yield any significant process or quality improvement because they fail to incorporate Lean and Six Sigma tools and methods. Furthermore, Lean and Six Sigma are usually considered incompatible and too complicated for the average company. Pinnacle's approach overcomes these misconceptions and other barriers to efficiently, practically, and rationally develop a Lean BOS® that is a true foundation for continual improvement and organizational excellence. Contact Pinnacle to learn how to develop a Lean BOS ® at your company.